The Badger State is now even more alluring for Illinois workers and businesses. Wisconsin Gov. Scott Walker signed Senate Bill 44 on March 9, making Wisconsin the 25th Right-to-Work state. 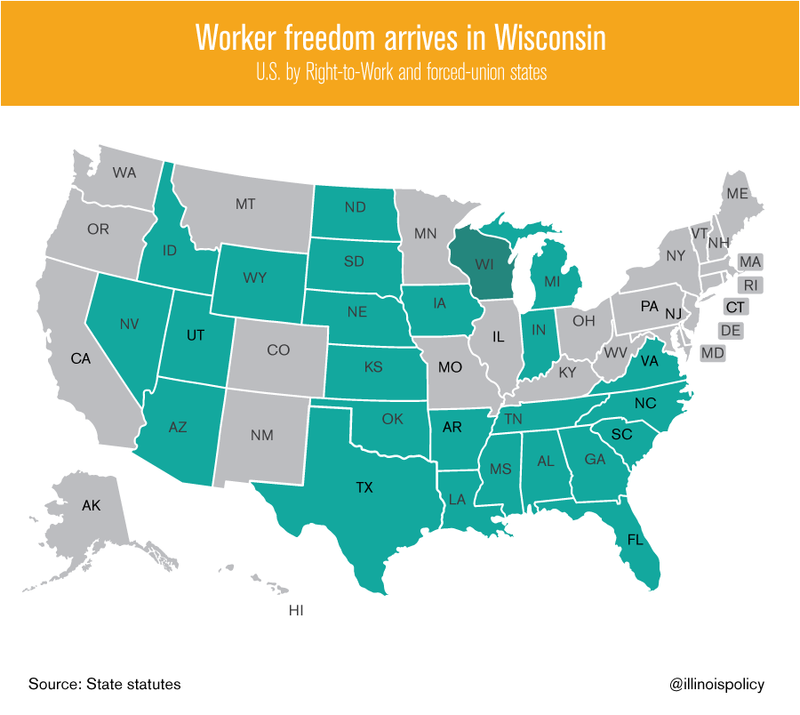 Roughly 140 million Americans, including nearly 6 million Wisconsinites, now live under laws that protect worker freedoms and individual choice. With this legal change, Wisconsin government has made the Badger State even more alluring for Illinois workers and businesses. 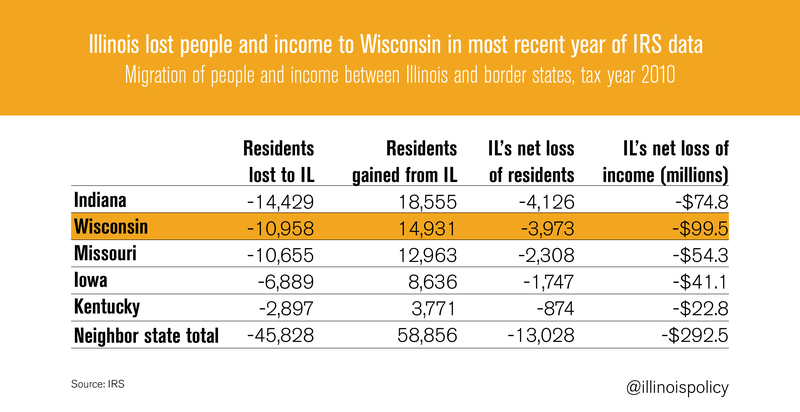 In 2010 – the most recent year for which taxpayer migration data are available – Illinois lost 15,000 people to Wisconsin, while only gaining 11,000 from Wisconsin, for a net loss of 4,000 residents and $100 million in annual income. 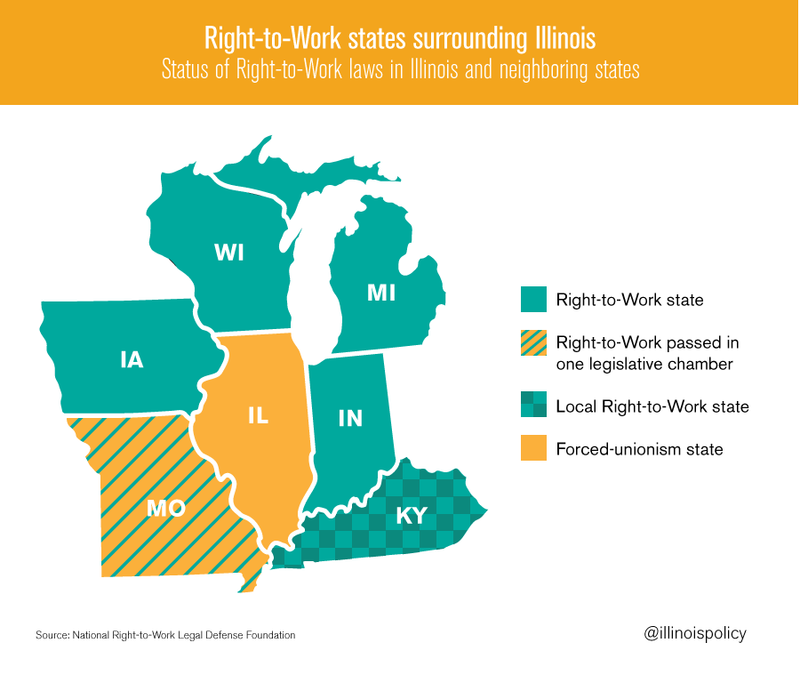 As Illinois’ neighbors increasingly embrace Right-to-Work laws, it is important to remember that in 2010, Illinois lost a net of one resident and $22,260 in annual income to a border state every 40 minutes. The trend is not new, as Illinois has been losing taxpayers and residents to neighboring states in every year since the IRS began producing taxpayer migration data in 1995. 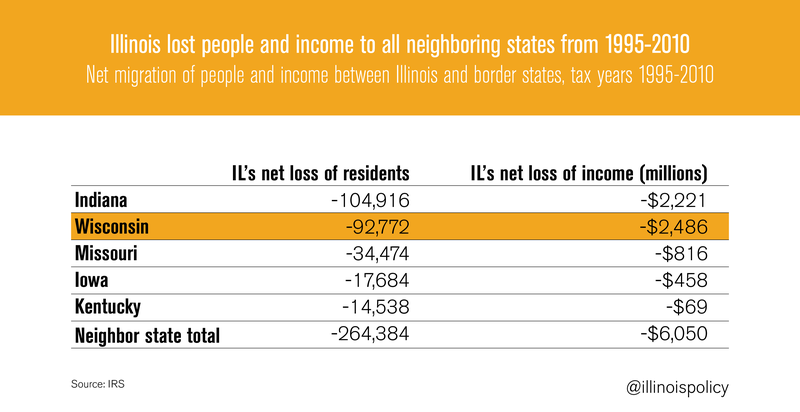 For the 16 years of data from 1995-2010, Illinois lost a net of 264,000 people and $6 billion in annual income to its border states. The Right-to-Work revolution sweeping across the Midwest is likely to cause Illinois to hemorrhage more people and businesses to its neighbors. Indiana, Michigan, Wisconsin and Iowa currently have statewide Right-to-Work laws. Missouri has passed Right to Work in its General Assembly, and Kentucky counties have begun enacting local Right-to-Work ordinances. Illinois state legislators are not going to pass a statewide Right-to-Work law any time soon. But that shouldn’t hold back Illinois’ home-rule municipalities, which are empowered to create their own ordinances for areas of the law that are not reserved powers of the state. Thus, Illinois municipalities can act locally to bring the Right-to-Work revolution to Illinois.